Guitarist Steve Byrd passed away on October 2, after an incredible career in music. Steve Byrd passed away on Sunday, after suffering a heart attack in Munich (Germany). Steve was Kim's guitarist between 1982 and 1995. 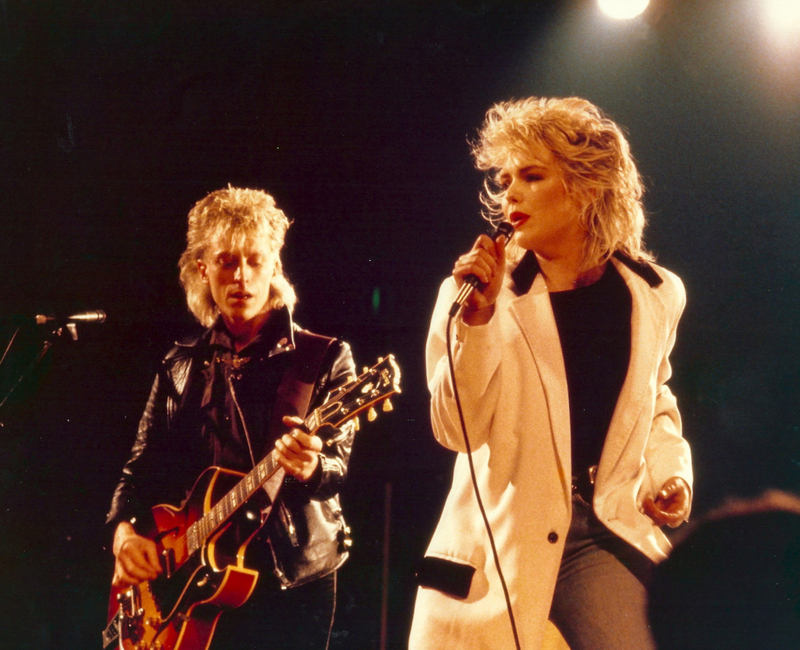 Together they composed dozens of songs, some of which were included on Kim's albums from 'Another step' (1986) onwards. Rick showed me the chords to Chequered Love and Kids in America and we were off. Kim was not present and of course I was slightly disappointed as I love to show my skills to a beautiful girl and she was one of the hottest at the time. We got through the songs with no problems as they are not technically demanding,relying more on energy and vibe and I had both in abundance. They thanked me for coming and said they would call me later. Near the end of filming, Hillary, [director] Mike [Mansfield]'s boyfriend said "Steve can you drive?". I had just passed my test and bought a white mini the week before so I said of course I can drive. "Ok", he said "open the door for Kim wave her into the Rolls Royce and then climb in and drive it off". I became very nervous, a mini and a Rolls Royce are like a goldfish and a Blue Whale. Size matters at these times, let me assure you of that. As I sat in the Rolls I couldn't recognise any of the controls, where was the gearstick? Where was the clutch, I looked around to no avail. (...) "Never mind, I'll do it", he said, "you won't be in shot anyway". So I never got to drive the Rolls Royce, but hey who cares? According to Steve, the guitar riff you hear in the first few seconds inspired part of the song 'Rage to love'. He appeared quite prominently in the music video for this song as well, and it was the one that got him to write songs with Kim for the next album, 'Another step'. They recorded many demos, from which the songs 'Another step (closer to you)', 'The thrill of it' and 'Missing' ended up on the album. While Kim went on to promote the album, Steve founded Heartbeat UK together with Jon Moss from Culture Club, plus singer Steve Lambert and bassist Mark Heywood Chaplin. They had one minor hit with 'Jump to it', but no further releases followed. When Michaels entourage arrived at a Stadium, the whole backstage areas would be closed down by his 100 personal security. This would mean that if you were just enjoying your delicious backstage caterers food, he would arrive and you would be locked in to whichever room you were in. One day I needed to pee during meal, so I went to the toilets that apparently had no locks, I didn't know this but walked out of the loo and opened the door to the canteen and there was Michael with two or three minders. He gave me a nice smile and said Hi. The next day...he had new security. (...) It was a wonderful experience for me to be able to participate in this tour and I shall treasure it now and forever. Steve continued to write with Kim, contributing 'The light of the moon (belongs to me)' and 'Too late' to the album 'Love is' (1992). Up until the Hits Tour in 1994, he toured with her as well, his live guitar work immortalized in the TV recordings of Sopot festival, Nachtwerk and Gross Gerau. Kim Wilde left the music business for a while, and Steve went his own way. He started composing and recording film and TV music for Zomba, playing with the band The Mods and 4 Bills and a Ben. In 2011 he founded Byrdsongs, a label that released, among other things, the single 'Sweetest of all darlings' by Stereoblonde, which was produced by him and on which he played guitar. During the weekend, Steve was in Germany, enjoying Oktoberfest in Munich. He suffered a fatal heart attack on Sunday. He is survived by his ex-partners Kim and Kathryn and his children Mel, Adam and Georgina. His musical legacy lives on.